Workers in the electrical industry are often exposed to hazardous and potentially dangerous workplace conditions while working outdoors in the rain. The Zetel ® ArcSafe wet weather apparel was specifically developed by Elliotts to provide Australia�? ?s leading solution for the protection of workers against electric arc flash in wet weather conditions. ZETEL® ArcSafe Wet Weather Clothing offers increased hazard specific protective performance to address specific needs and hazards in the electrical utility industry for Australasian conditions. 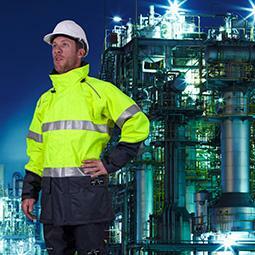 �?�ZETEL® ArcSafe clothing is highly visible, waterproof, breathable, windproof, flame resistant and offers protection against electric arc hazards. Elliotts ZETEL® ArcSafe is a three layer, flame retardant, durable, breathable, waterproof and windproof fabric. ZETEL® ArcSafe offers electric arc flash protection of HRC2 (ATPV 11). ZETEL® ArcSafe conforms to the requirements of EN1149-3:2004 - Protective clothing electrostatic properties-surface resistivity. Protective clothing electrostatic properties-surface resistivity.